Brand: CK Products 42-200 Units: 1 gal. 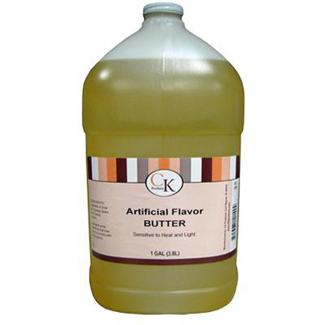 jug Add butter flavoring to your baking recipes for an enhanced butter taste. Use in cookies, cakes, pastries, and more. Artificial. Sugar-free. Add butter flavoring to your baking recipes for an enhanced butter taste. Use in cookies, cakes, pastries, and more. Artificial. Sugar-free. Ingredients: Vegetable or Soya Oil, Diacetyl, Butric Acid, Esters, Vanillin.